I love reading! After a long day of having to think and solve problems there is nothing better than lying on my bed reading. Lately it seems mostly what I read is aviation based. Partly because I enjoy the stories and partly because I like learning the history. 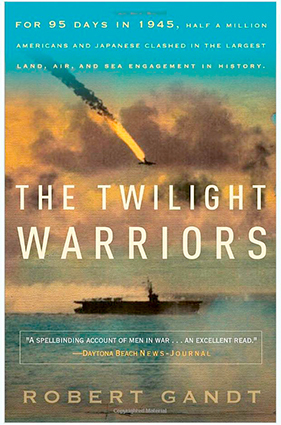 Well I just finished reading The Twilight Warriors which is about a group of Corsair pilots as they fight during the invasion of Okinawa, the last island of the Pacific War before Japan. I got to say it’s a pretty good book. If you’re like me and don’t know much about that chapter of history it’s interesting to learn about. For instance it goes into a lot about the different types of Japanese kamikaze’s, dog fighting, naval strategy and overall why they kept fighting. If any of that sounds interesting to you, go get the book.